Puget Sound's master planning process will unfold over the next 20 years. It began in fall 2003 - summer 2004 with an intensive planning phase to evaluate the needs of the university and its relationship to the broader community. With input from the campus and community, the plan has been approved by the City of Tacoma, and many projects are underway. During summer 2008, we created an improved entrance to campus at Alder St. and N. 15th. The enhanced space creates a more visible and welcoming entrance to the east side of the campus, and creates a safer passage across busy Alder Street for students, faculty, staff, and visitors. Besides completing the new Center for Health Sciences during summer 2011 (begun summer 2010), construction projects during summer 2011 include the installation of Commencement Walk, running from the north end of campus to the south end; a new entry for Collins Memorial Library; and renovations to the Wheelock Student Center lobby. A series of diagrams have been developed to illustrate the relationship between the physical layout of the campus and the people who live, work, study, and gather here. A three-dimensional version of the master plan is available for view in Collins Memorial Library. As Puget Sound considers a new campus master plan, President Thomas shares his thoughts on the animation of place. A way to think about linking all parts of the campus together in a way that celebrates the distinct qualities of each area. Identifying physical attributes of the campus that make it a unique and enriching academic environment. A tool to assess how Puget Sound campus provides effective and meaningful spaces for all who participate in the life of the campus. 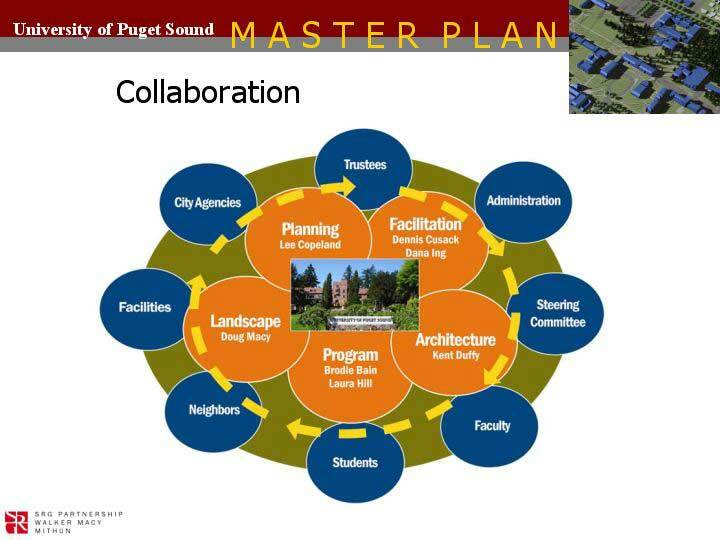 The roles in the Puget Sound Master Planning process and how they work together. A slide from the Master Plan Progress Report, courtesy of SRG Partnership. 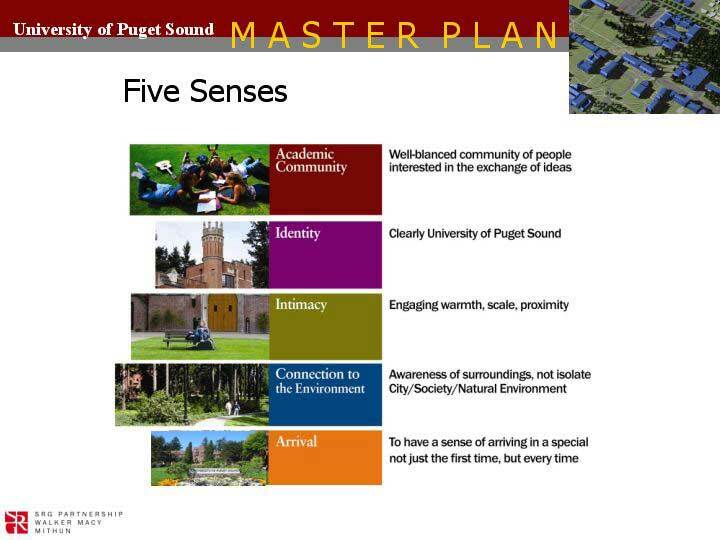 Five major areas of emphasis for the master plan. A slide from the Master Plan Progress Report, courtesy of SRG Partnership.